If they did that, then they just should have brought back the original, especially since it's only a 1 year deal. The eggplant stripes between the white & silver should be black, if you're going for a color swap, as well as part of the collar. Although it's a stunningly beautiful take on their original jersey, I agree they shoulda made it purple not black. The Ducks jersey - what a goddamned mess. The webbed foot looks completely out of place on the shoulders; it actually looks like what a minor league team would do to show their affiliation with the parent club. The bottom had so much potential, but the top is a complete disappointment. This jersey is a girl with a great body and a horrific face. Fine. It's fine. Serviceable... like fast food that lost its hotness in the car but isn't outright cold. Or a WatchMojo top 10. Not a fan. 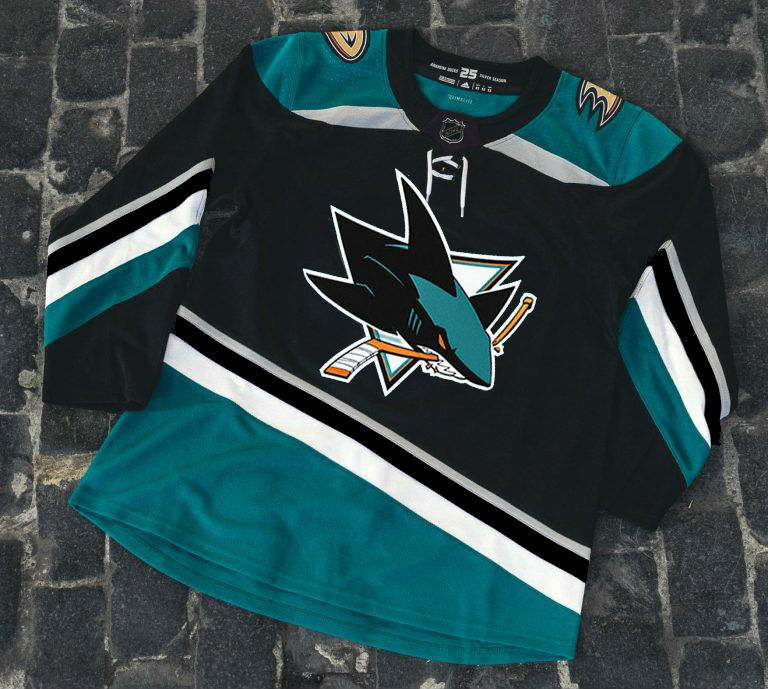 Sharks colours, yokes that clash with the classic striping, etc. It’s for when you want a hodgepodge of retro elements on a moder frame with little concern about how they mesh together. An ugly mess ensues. It was a nice idea but the execution just wasn't there. There's too much going on at once. Should've just gone with a throwback. I think it looks great... Aside from the shoulder patches that don't fit in any way what-so-ever. Objectively that’s a great jersey. If it was meant as a fauxback, not great. This sweater will be a good test of how the general public doesn't notice fine (and even medium) jersey details. 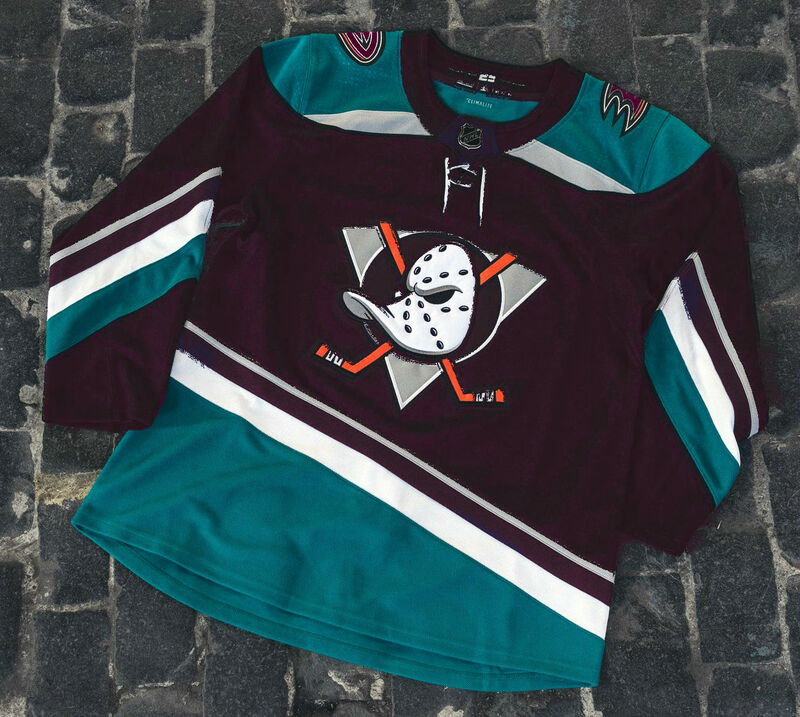 I'd wager that 90% of Ducks fans think this is exactly the sweater they once wore. I honestly don’t know what to think about the jersey. They did too much of an effort and yet seems like they didn’t make enough of an effort. Using every single colour in Ducks history is interesting too. It also appears this is just a 25th anniversary jersey as the Ducks are only using it for this season. I like the idea but the execution is lacking. I think swapping the black body for eggplant, using the same number font throughout the jersey, and changing the wrist striping would have gone a long way in helping the final design.